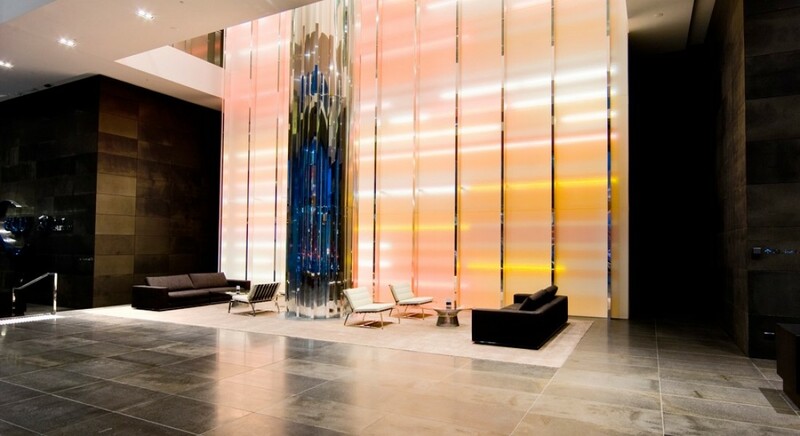 The lighting to the foyer and tower components of the site were designed to maintain the solidity and strength of the architectural forms while using the central integrated cold cathode and LED feature wall as the focal point and axis within the foyer. The main element within the foyer is the integrated feature wall. This wall is made up of a combination of both lighting elements, a diffusing layer and background colour on the rear wall. This combination provides a highly variable effect with a random array of cold cathode and the interspersed LEDs creating a subtle and slow variation so the wall never appears the same at different times of the day. The exterior lighting to the tower on the William Street frontage links the foyer and the tower to the site and central plaza via the use of linear glowing luminaires in the canopy. The central plaza area was designed with NH Architecture and utilizes linear glowing luminaires to accentuate the raking angled architectural lines of the space which contrasts against the strong verticality of the tower.